When I was writing An Uncommon Duke, one of my favorite things to research was the art collection owned by the Prince Regent. In the story my heroine, Olivia, is one of the people the Prince Regent turns to when he wants to acquire new pieces. Aside from his passion for women and food, King George IV adored fine art. While he was Prince of Wales, he began collecting paintings and by 1816, 136 paintings decorated the suite of staterooms at Carlton House. His bedroom suite alone showcased an additional 67 paintings, and he had 250 other paintings in storage. Amassing a collection this large took some help, and George turned to men who were influential and informed collectors of art in their own right. He looked to Sir Charles Long (later the 1st Baron Farnborough), Walsh Porter, and Sir Thomas Lawrence for advice on paintings to add to his collection. Lord Yarmouth, who became the 3rd Marquess of Hertford, served as the Prince Regent’s agent at art sales from 1810 to 1819. This painting was purchased by George in 1811 for 5,000 guineas. The couple were identified as Jan Rijcksen and his wife Griet Jans. He was a shareholder in the Dutch East India Company and their master shipbuilder. This painting is part of George’s substantial collection of Dutch and Flemish masters. 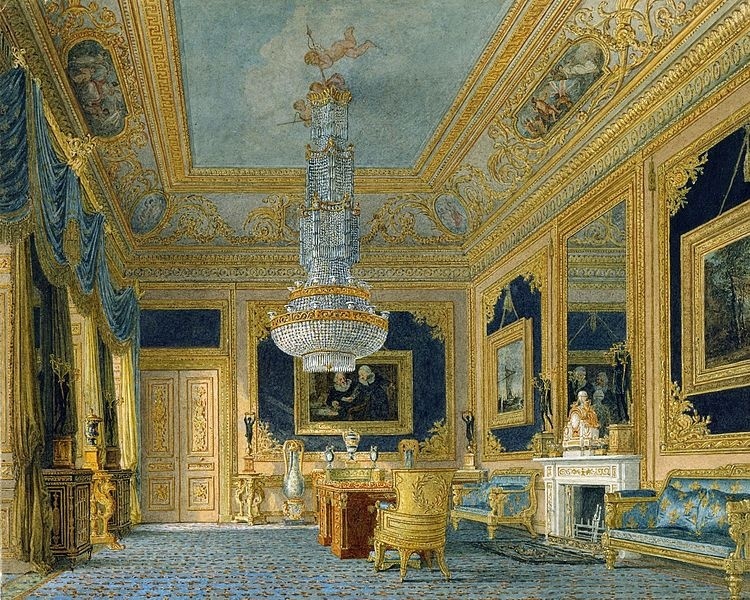 It hung in the Blue Velvet Room in Carlton House as shown in this 1818 watercolor by Charles Wild for The History of Royal Residences by William Henry Pyne. George purchased this self-portrait by Rembrandt in 1814 from Sir Thomas Baring along with of a group of 85 Dutch and Flemish paintings. Most of them were collected by Sir Thomas’s father, Sir Frances Baring. 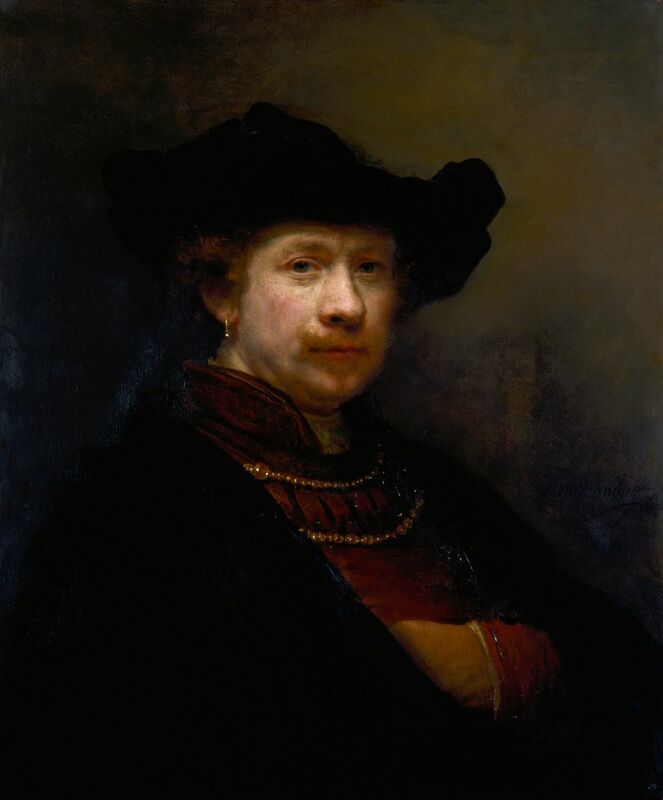 The self-portrait is dated 1642, when Rembrandt was 36 years old. It is comparable in many respects with his self-portrait of 1640, which is in the National Gallery in London. Unlike the earlier portrait, this one does not possess a ledge along the lower edge of the composition. 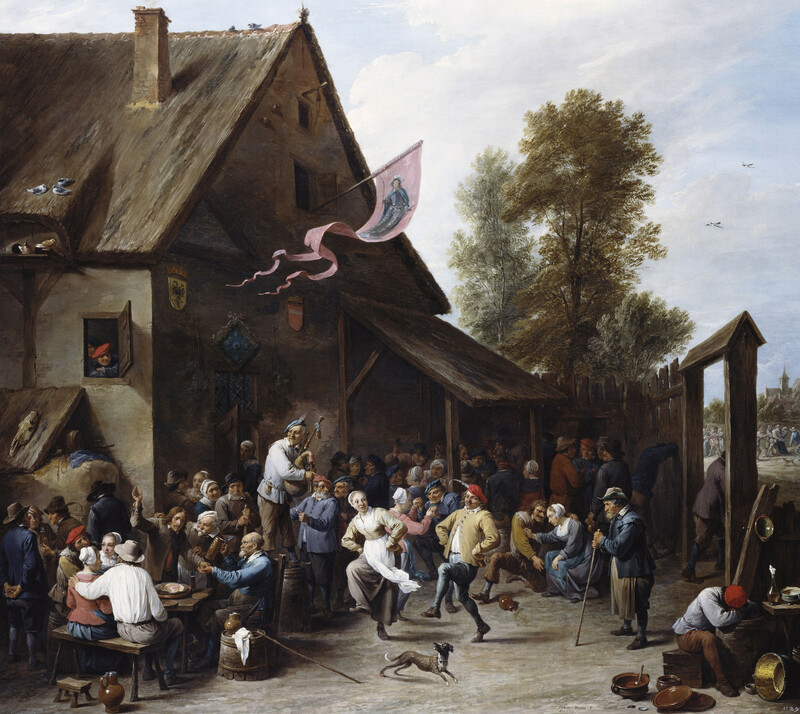 David Teniers’s work was much sought after in the early 19th century. This painting was the most expensive of Teniers’s work in George’s collection. It was valued in his 1819 inventory at 1,500 guineas. This painting was purchased for George from M. De la Hante in Paris. In the center of this painting, the Duc de Bourgogne is sitting a grey charger and holding out his sword to kill the stag. 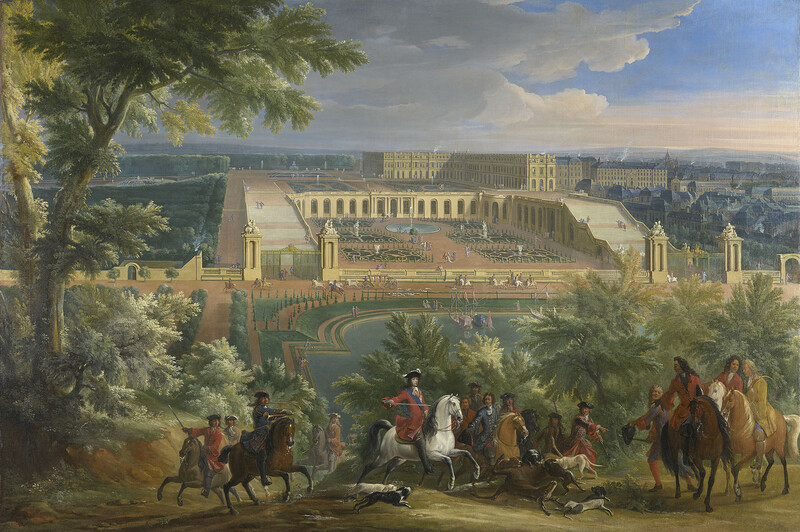 In the background is Versailles, the Orangerie, and the city. It didn’t surprise me when I found a painting like this one in George’s collection. This is an allegorical painting about seduction and temptation. The woman is shown partially undressed, putting on her stocking. She looks straight out at the viewer with an inviting expression. The viewer is kept out by the arched doorway, which no sensible person should cross, however strong the temptation. The images on the doorway symbolize constancy, domestic virtue and chastised profane love. The objects scattered throughout the room signify the effects of misdirected sensual pleasure. 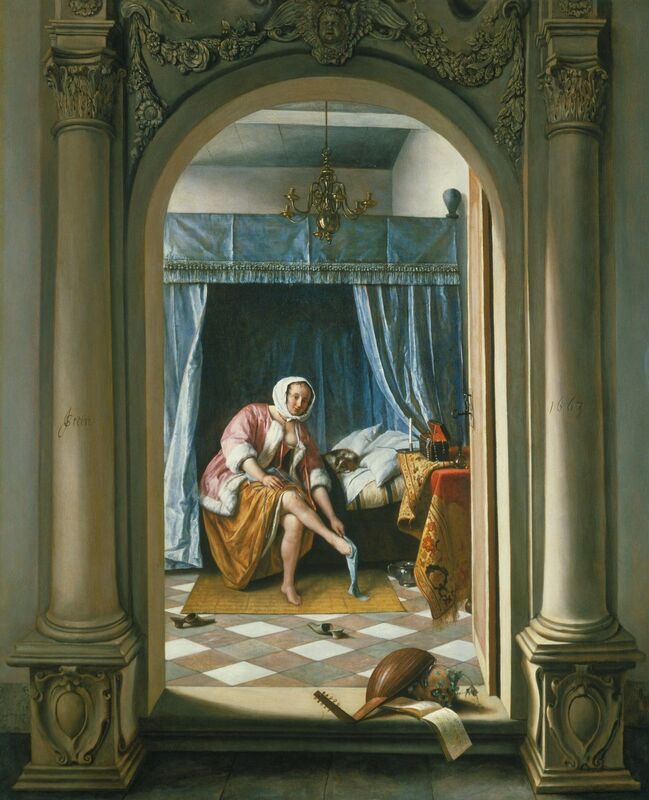 Steen implies that to pass through the doorway would be to risk the loss of virtue. This is a scene designed to appeal to the discerning eye of a man of fashion, who in this era would have possessed an understanding of horseflesh and an appreciation for an efficiently run mews and well turned-out servants. These things mattered, because they were a reflection on the owner and master—in this case the Prince of Wales. The depiction of his phaeton shows the viewer that George was unstuffy enough to drive his own carriage. The pomp of a Prince is replaced by the elegance of a man of fashion. 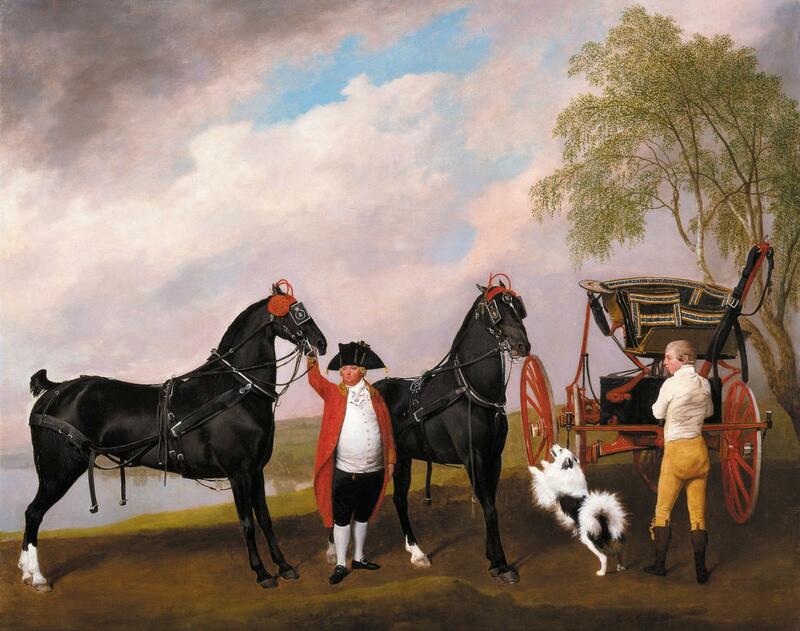 The men in the painting are George’s portly coachman and the man’s assistant. 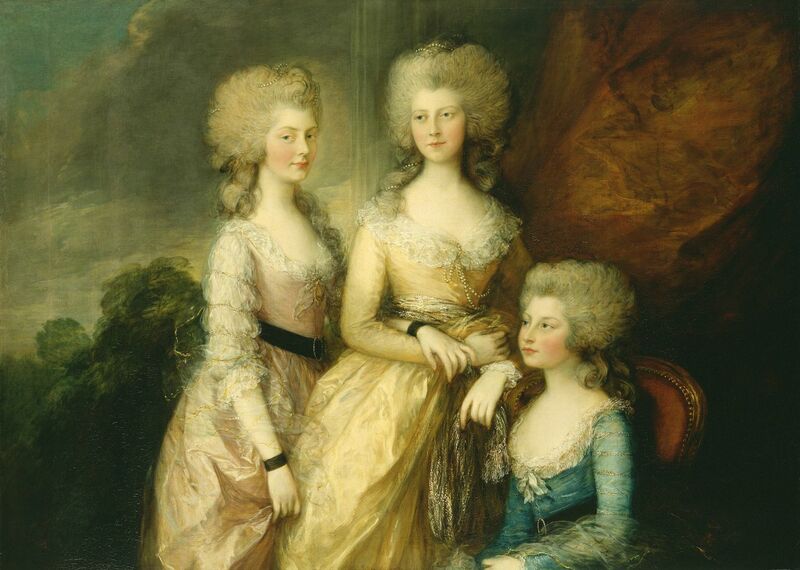 George commissioned Gainsborough to paint his three eldest sisters in a full-length group at the cost of 300 guineas. Gainsborough placed Princess Augusta on the left, Princess Charlotte in the center, and Princess Elizabeth on the right. Their arms are affectionately entwined, reminiscent of the intimate depictions of the Three Graces. The work was originally to be shown at the Royal Academy in 1784, however Gainsborough and the hanging committee could not agree on where the painting should be hung. He withdrew the work, showing it instead in his studio in Schomberg House before it was hung in Carlton House. I think my favorite is the Gainsborough, but that might be because I am very partial to portraits. Let me know which one caught your eye. “The shipbuilder and his wife” is often believed to be one of the best pieces of the collection. That George hung the painitng so prominently is said to prove his excellent taste in art. Well, I am not so much into Dutch and Flemish Art. I like the Gainsborough best, too. 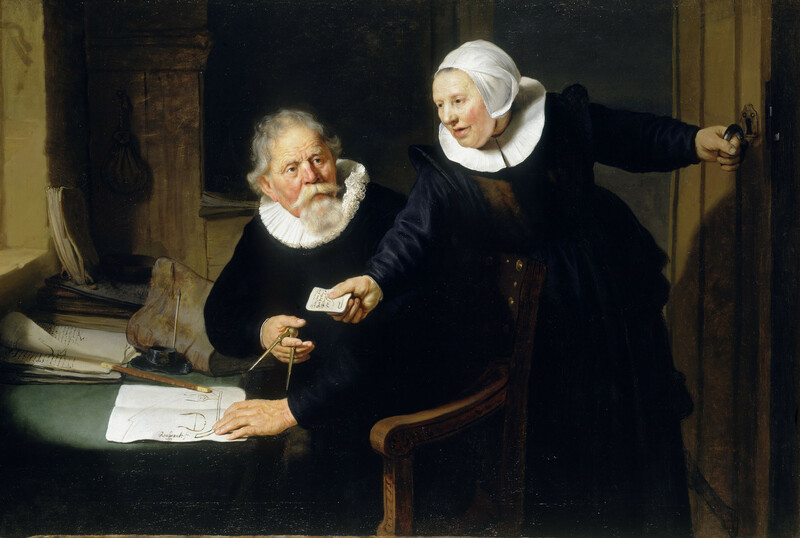 Rembrandt’s “The Shipbuilder and his Wife” is stunning.. but how was anybody so wealthy that they could afford to spend 5,000 guineas in 1811 on a single art object. Even the Prince of Wales must have some limit on his spending. Thanks for stopping by. One would think that was the case, but Prince George led an extravagant life. When he turned 21 in 1783, he was granted £60,000 (equal to £6,303,000 today) from Parliament and an annual income of £50,000 (equal to £5,252,000 today) from his father. Surprisingly, this was far too little for his needs. His stables alone cost £31,000 a year. Four years later, George was in debt and Parliament granted him £161,000 (equal to £17,850,000 today) to settle his debts and £60,000 (equal to £6,652,000 today) for improvements to Carlton House. He did not see a need to adjust his lifestyle. By 1795, his debt was £630,000 (equal to £56,791,000 today). Parliament was not willing to make an outright grant to relieve these debts, but it provided him an additional sum of £65,000 (equal to £5,859,000 today) per year. In 1803, a further £60,000 (equal to £4,781,000 today) was added, and the Prince of Wales’s debts of 1795 were finally cleared in 1806, although the debts he had incurred since 1795 remained. As you can imagine, he was not very popular with his people since they were the ones paying for his lifestyle. These paintings were gorgeous. Thank you for explaining the messages in them as well as their histories. I didn’t know about any of it, so it was fascinating! Thanks, Lydia. I’m glad you enjoyed looking at them. It was hard to decide which paintings to leave out of the article, but I had to leave some out because it would have become a VERY long post.